To celebrate the one-year anniversary of TravelMamas.com, one lucky family will win a vacation package to San Antonio, Texas at the world’s largest JW Marriott Resort! 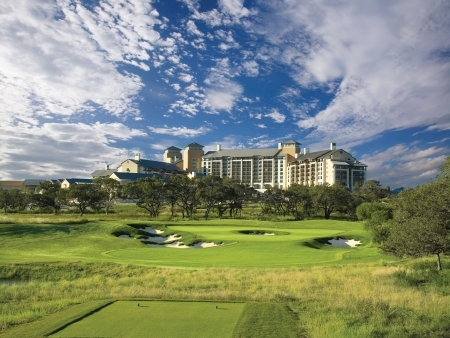 Because the point of a vacation is to relax and have fun, the two-night package at the JW Marriott San Antonio Hill Country Resort & Spa includes special goodies to pamper every member of the family. Approximate retail prize value is $1,000. Read on to learn how to enter! Earlier this month my family spent a few days at this beautiful resort. All vacations hold a special place in my heart for the moments of togetherness and wonder that can only be felt through travel. However, some destinations stamp a bigger imprint on my heart. It is the memories garnered on these trips that lull me to sleep on restless nights. The world is big with many new places to explore so I seldom like to return somewhere I have already been. However, I am already dreaming of a return trip to San Antonio, and to this JW Marriott in particular. Let’s start with something all moms deserve…a little relaxation at the spa! After a dip in the whirlpool, I received a Saving Face facial. This included a gentle enzyme peel and healing mask as well as an upper body massage and nourishing hand treatment. If you can’t decide between a facial and a massage, this is a good choice because it felt like both rolled into one heavenly treatment. Next, I had a Restorative Organic Massage with a scalp massage, hot towel massage and foot treatment. While this allowed me to slip into that lovely state of spa-induced half-awake, half-comatose Zen; it felt more like a body treatment than a massage to me. With eight other massages to choose from, next time I think I’d opt for the Citrus and Sunflower Organic Massage, which combines essential oils with a traditional full body massage. Rather than hurrying back right away, I took advantage of this rare bit of me-time by showering and readying at the spa. They had everything I might need right there from lotions, soaps, and mouthwash to disposable razors. I was a happy bowl of pudding by the time I left to rejoin my family! The Lantana Spa suggests you arrive at least a half hour early to check-in and take advantage of the spa’s hot tub, sauna, and steam room. I suggest you go even earlier; how often do you get to relax and have some time to yourself, free of a kid pulling at your pants leg or complaining that their brother got the bigger half of the cookie? I have only golfed once in my life but my husband, Phil, was thrilled to have a chance to golf at a TPC PGA-Tour golf course. He was given the choice of two courses, one of which was regarded as easier and therefore more appropriate for the non-professional. Phil is a pretty decent golfer so he chose the more difficult course. 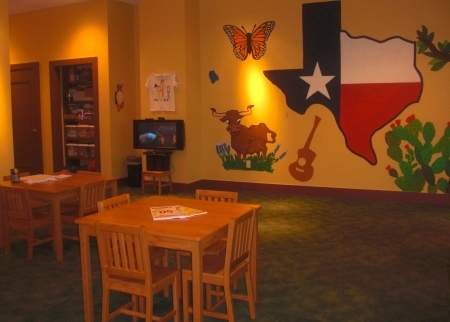 If you will be staying here during a busy time, like spring break or summer, be sure to sign up for Range Riders before you leave home so you can snag a spot in this delightful kids club. Upon check-in at the hotel my daughter, Karissa, received a treasure map that led us to Range Riders. Following the map’s path was a wonderful way to get her excited for her adventure away from mom and dad! During warm weather, kids are asked to bring a bathing suit and sunscreen for a splashing good time with the counselors and other campers at the kiddy pool. 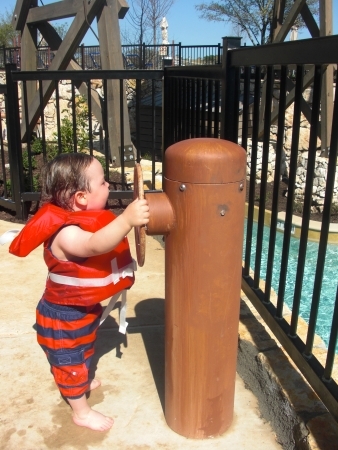 No need to worry about safety either since kid-sized life vests help keep children safe poolside. I stopped by a couple of hours into Karissa’s Ranger Riders experience and she begged me to let her stay longer (which I happily obliged). She had a busy day, filled with lunch, crafts, and make-believe play. She had a lot to show for her efforts too. A photo of Karissa standing by the Range Riders’ life-size plastic bull was placed into a frame that she painted herself and decorated with stick-on jewels and puffy letters to spell-out her name. She also drew a stick-figure portrait of her family with special markers on a souvenir Range Riders t-shirt. Due to my daughter’s age (we celebrated her fifth birthday at the resort), this was Karissa’s first experience at a hotel kids camp. Many resort kids clubs start at the age of five, but this program allowed kids aged four and older who are potty-trained. When I asked Karissa if she liked Range Riders, she said, “I loved it!” What did she think was the best part? “My teachers, Miss Perry and Miss Courtney!” I can’t think of a better endorsement than that. The best part of our stay at JW Marriott San Antonio was the time we spent together at the resort’s River Bluff Water Experience. We could’ve spent all day just splashing in the little kids’ zero-entry pool, with its fountains, three small slides, but there were too many other watery diversions to enjoy! My husband and I took turns climbing the Water Tower to zoom down the Acequia Tube Slides with our daughter in a double inner tube. There are two exhilarating options – one slide that is mostly open-air and one mostly-enclosed tube slide. Karissa didn’t want to brave the latter, so I went it alone (for research purposes, of course!). Not only was the River Bluff Water Experience a whole lot of fun, but also it was beautiful. 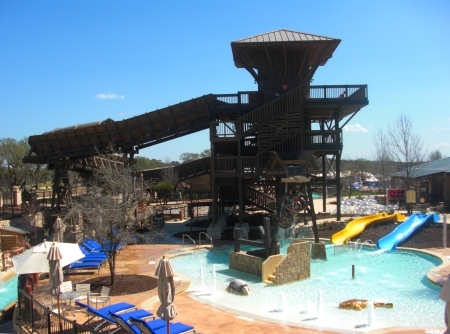 The 1,200-foot lazy river was lined with Cypress trees and walls made from natural rock. I almost felt as if I were floating down a real river through the Texas Hill Country! For some mischievous fun, kids can spin and pump various mechanical doo-dads to spray other guests afloat on the river. This may have been my two-year-old son Leo’s favorite part! He giggled and stomped his feet as he watched in awe when his actions from above made the water shoot out below. For dining, there were six restaurants plus room service to choose from. The fanciest was 18 Oaks, where I dined on a sublime steak. 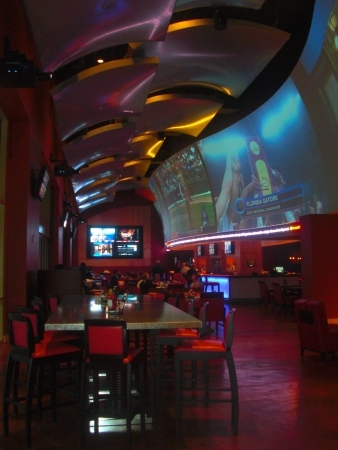 The most unique eatery was the High Velocity Sports Bar with its winding wall of television screens. For a quick breakfast or snack option, there was also a Starbucks onsite. A favorite memory from this trip was listening to live country music echoing through the resort’s two-story lobby as my kids joyously danced about. The lobby contains a bar on the lower level with billiards plus checkers and chess tables inviting guests to linger in this expansive lounge. While San Antonio offered plenty to do outside the resort, the JW Marriott San Antonio was the kind of place you don’t want to leave. Maybe it was because it was a new resort, but the staff exuded a warmth and excitement that is rarely found. You could easily spend a whole week just enjoying the resort’s amenities and never get bored. So what are you waiting for? 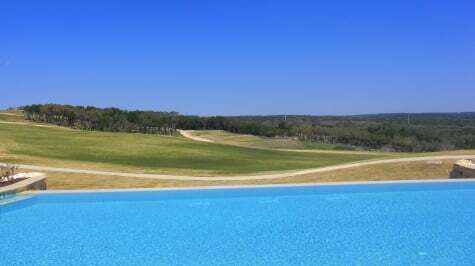 Enter to win a family getaway at the JW Marriott San Antonio Hill Country! THIS CONTEST HAS ENDED. THE WINNER HAS BEEN NOTIFIED BY EMAIL. IF THE WINNER DOES NOT CLAIM THE PRIZE WITHIN ONE WEEK, ANOTHER WINNER WILL BE CHOSEN AT RANDOM. THANK YOU FOR ENTERING! This contest ends at 11:59 pm Pacific Standard Time on Saturday, April 3, 2010. The winner will be selected at random using Random.org and will be notified by email. If no response is received within one week, the first winner will forfeit the prize and another entrant will be selected. JW Marriott will provide the prize to the winner. The value of the package is $1,000. The prize is valid for one year and must be redeemed by March 31, 2011. The prize information must be presented when making reservations. There is no cash value. There are no substitutions in the prize package items. The prize is not transferable. You can enter a maximum of four times, using each method of entry once. The first option is required for entry. For each bonus entry, you must add an additional, separate comment to this blog post. REQUIRED ENTRY: Leave a comment below about which feature of JW Marriott San Antonio you would most like to experience and why. Please be specific! General comments will be disqualified. BONUS ENTRY: Become a Fan of Travel Mamas on Facebook. Then submit a comment on the Travel Mamas Fan Page wall stating why you deserve to win a getaway to JW Marriott San Antonio. Be sure to come back here and repeat your comment below! BONUS ENTRY: Become a Travel Mama to receive bimonthly e-newsletter updates. If you already receive the e-newsletter, that counts! Just be sure to make a comment below saying that you are on the distribution list! A note from the Travel Mama: In preparation for this incredible giveaway, my family and I were hosted by the JW Marriott San Antonio Hill Country Resort & Spa for a three-night stay. I am the first woman my boyfriend has introduced to his kids and I’ve just started getting to know them on the weekends his ex-wife doesn’t have them. It would be such a meaningful experience for all four of us to spend uninterrupted time getting to know each other in such a relaxing yet exciting environment, especially because the kids would be so happy in the pool. I would love to go to the River Bluff Water Experience. 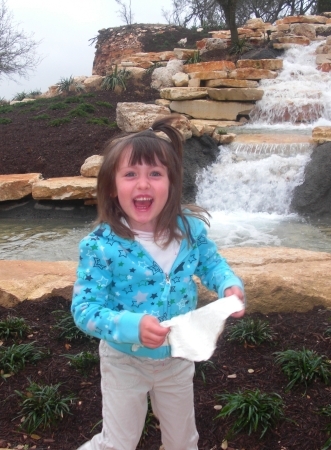 My granddaughter would have a wonderful time and I could stay cool in San Antonio’s exceptional hot weather. I would love to have a spa treatment at this place. JW Marriott’s are amazing. Thanks for the chance to win! Oh man! I could really go for a Citrus and Sunflower Organic Massage ;o) That spa sounds amazing! I could use a little pampering! I would love to experience the Texas Sarsaparilla and Coffee Scrub at their spa because it sound like a relaxing experience. I would absolutely love to experience the Lantana Spa’s Spirit of the Curanderos Energy treatment! I particularly love that they use natural mineral salts and offer a massage with wild crafted organic lavender oil. My lifestyle revolves around organic, healthy products, so this would be perfect. I also need to de-stress! 😉 Thanks!! I became a Travel Mama and am now on your distribution list. The River Bluff Water Experience sounds amazing and my family would love it. We love floating down lazy rivers and splashing in pools. It’s right up our alley! Brilliant information. I’ll make sure to return as I write a travel blog for families. Wow, this place looks great! My son is too young for kids’ club yet but they seem like a great way of getting a bit of grown up time! My name is Holly and I am a mother of 6. I have 4 girls and 2 boys. I would love to be able to take my kids to San Antonio. My husband and I were married in January. Neither one of us could take the time off or have the funds for a honeymoon. So a weekend away with all our kids in San Antonio would be great!! !